and mix it in a bowl with the capers, mayonnaise, cornichons, lemon zest and some seasoning. Remove any tough stalks from the remaining watercress. 3. Preheat the grill to high. Toast the slices of bread, in batches, and butter them. 4. 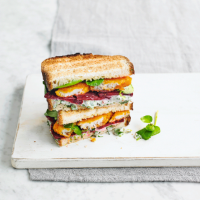 Spread watercress tartare on four of the slices of buttered bread, top with slices of beetroot, 3 fish fingers, a handful of watercress and finish with another slice of bread. Slice in half to serve.